I've been calling this recipe a compote all week but then had a second thought. It could be a chutney. Here it is: chutney is made of cooked fruit and vegetables (not just fruit) and contains vinegar. A compote, on the other hand, is simply fruit cooked in sugar syrup. So this strawberry-rhubarb bad boy is in fact a chutney. I stand corrected. And so does the title of my post now. 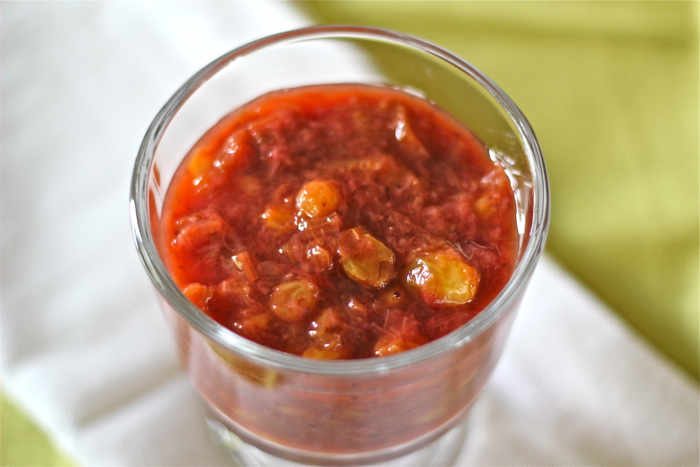 This strawberry-rhubarb CHUTNEY is very easy to prepare and so perfectly seasonal right now. I served it with some roasted chicken breasts (it cooks while they do): absolutely the perfect accompaniment. I'm sure it would also be fabulous with pork tenderloin. And if I freeze enough strawberries and rhubarb right now, it may make a lively and unexpected appearance on the Thanksgiving table to go with our deep-fried turkey. Combine all ingredients in a saucepan. Bring to a simmer over medium heat. Reduce heat to low, cover and simmer for another 10 minutes or until the rhubarb is tender and the fruit is all broken down and chunky.